NFV was introduced to reduce the number of hardware platform and create flexibility in network and IT domain. NFV aims to leverage IT standard virtualization technology to consolidate network applications into telecommunication standard service switches and storage and to create openness towards application layer. NFV is to create virtualization layer between the software and hardware. The decoupling of hardware and software removes challenges that operators today have in regard to dependencies of the two like upgrades, expansions, new functions and all activities in network that impact the individual nodes and create long lead time. With the decoupling of software and hardware all of these mismanages will be removed. Additionally to this since the hardware base is not application dependent, it gives the operators possibility to allow other users to utilize the network, creating a new revenue stream and important part is all this can be managed in cloud. Meaning that cloud shall orchestrate the virtualization layer that it in turns automatically administrate the cloud resources at hand. NFV is implementation of network functions as software only entities that run over the NFV infrastructure (NFVi). 1- Virtual network functions (VNF) – as the software implementation of network function which are capable to running over NFVi. A VNF is virtualization of network functions in a legacy non virtualized network. E.g. : NF is 3GPP evolved packet core EPC network management, such as mobility management entities (MME), serving gateway (SGW), and Packet data network gateway (PGW), Residential gateway (RGW), dynamic host configuration protocol (DHCP) servers, firewall etc. A VNF can be composed of multiple internal components. E.g. one VNF can be deployed over multiple virtual machines (VM) or each VM host a single component of VNF. In other cases whole VNF can be deployed on single VM also. 2- NFVi– including the diversity of physical resources and how these can be virtualized. NFVi supports the execution of VNF. 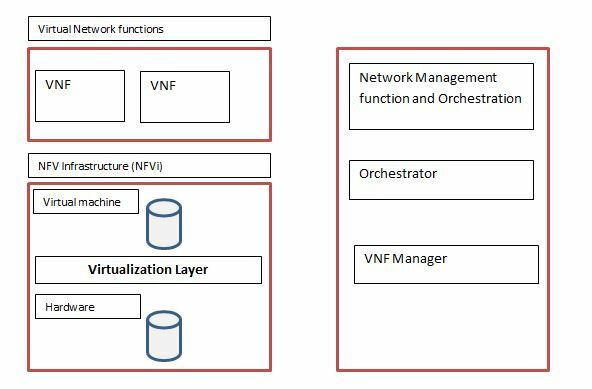 3- NFV management and orchestration– which covers orchestration and life cycle management of physical and software resources that supports the infrastructure virtualization and life cycle management of VNF’s. Focus on all virtualization specific management tasks necessary in the NFV framework. The NFV framework enables dynamic construction and management of VNF instances and relationship between them regarding data, control, management and dependencies and other attributes. NFV architectural framework identifies the main functional blocks and main reference point between such blocks like VNF, EMS (element management system), NFVI (including HW and virtualized resources) and virtualization layers. Reduce CAPEX, OPEX, power consumption, time to implement the new network services, Improve ROI. Greater flexibility of scaling.